This page lists nearly 450 video explanations to all of the quantitative problems in the 9 official GMAT Paper Tests: Set 1, Set 2, and Set 3. 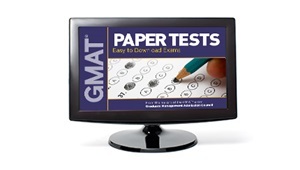 The GMAT paper tests are formatted in the way the GMAT exam was originally delivered before the introduction of computer adaptive testing. Some portions of the GMAT paper tests can be found in the earlier versions of the Official GMAT Guides. The bulk of the questions are on the easy side and I recommend these tests for students who want to get exposed to an easier set of GMAT questions that still retain the format and style of the GMAT test.